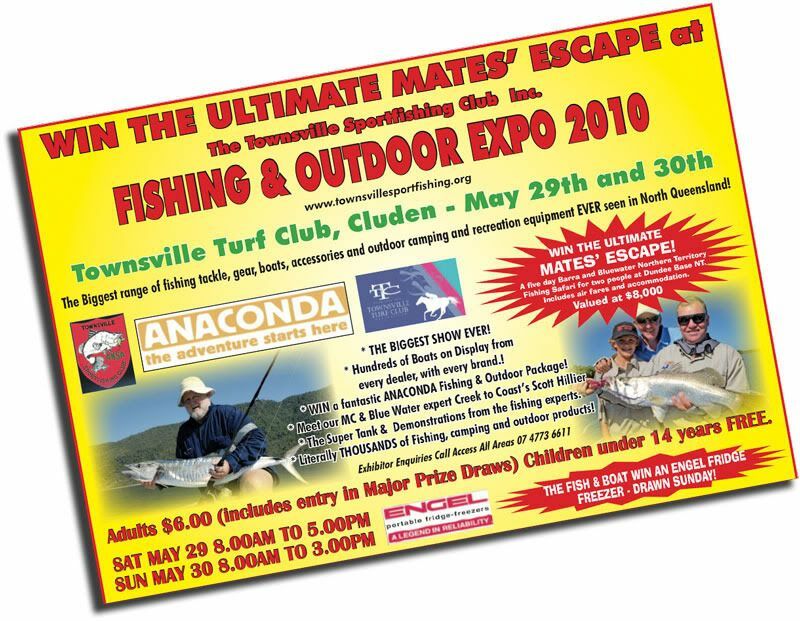 Townsville’s annual Fishing & Outdoor Expo on May 29th & 30th is set to establish a new record number of exhibits as the show becomes the largest fishing, boating and outdoor recreation expo in north Queensland. The annual Expo held at Townsville Cluden Park Turf Club has become a mecca for fishers and the general community and has now taken the mantle of the biggest show north of Brisbane. Townsville Sportfishing Club President Morry Suffield said that the strong support of local boat dealers who have supported the show wholeheartedly for the past two years has been the catalyst for the growth of the show. “While other events try to be something to everyone, we have always focused our show on fishing, boats and outdoors activity. We don’t take all-comers and we keep the standard very high. While other events and boat shows around the state have suffered or failed, the Townsville Fishing & Outdoor Expo has gone from strength to strength” Mr Suffield said. “Fishing and outdoor pursuits are really some of the cheapest forms of family entertainment and no matter how tight the budget is, wetting a line with the kids or mates is still a popular pastime and the growing numbers of recreational fishers is proof of that” Mr Suffield said. This year’s event will see as many as twenty new exhibitors and every brand and breed of boat and motor available from all local dealers. The event at Cluden Racecourse now draws 10 000 fishing, boating and outdoor enthusiasts each year. The biggest range of fishing tackle ever displayed will be available at this year’s event with exhibitors including Anaconda, Fishing Warehouse, Pro Tackle, and Tackleworld. “The best thing about checking out the fishing gear at the Fishing & Outdoor expo is that not only can you buy the tackle, but you can talk to experts and be shown how to use it. The Sportfishing Club will again be manning its club display and giving talks on rigging lures, throwing a cast net, targeting specific species of fish and other interesting topics. People can also find out about the Sportfishing Club and how to join.” Mr Suffield said. Attractions this year will include the massive Anaconda display which is one of the largest exhibitors at the show, and the very popular Yamaha Super Tank. MC and Presenter Scott Hillier from Channel 7’s Creek to Coast will again man the microphone and be one of the many expert presenters on the main stage giving talks and advice on a range of fishing tips. The Expo has grown from just an event for fisho’s to one that the whole family can enjoy and find something of interest - the show is really about recreational lifestyle. There are all sorts of things to see at the event with fishing and camping gear, camper trailers, caravans, fisheries & other government agencies, clubs and community groups, safety equipment, canoes & kayaks and the latest in lures, rods, reels and boating accessories.